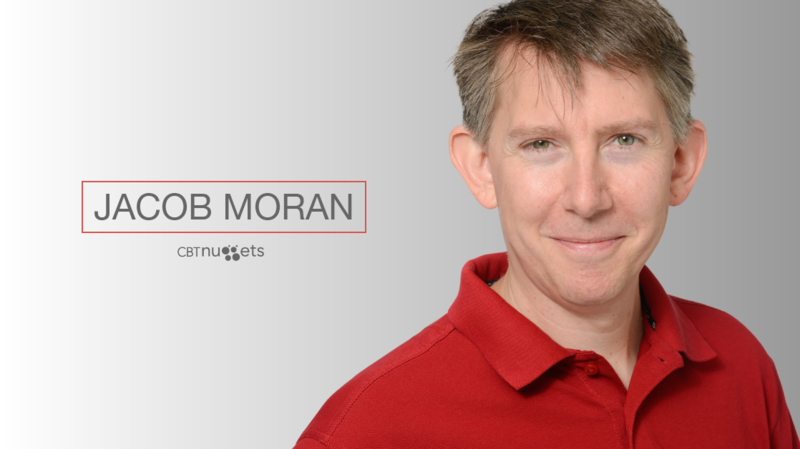 Welcome to our newest CBT Nuggets trainer, Jacob Moran. Jacob brings more than 20 years of training experience to the CBT Nuggets team. He’ll primarily be creating VMware and Citrix courses. He’s already partnered with Keith Barker on the VMware 6.7 update and will release a Citrix course soon. You may also remember that he joined us at VMworld 2018. Let’s start with the most important question. Star Wars or Star Trek? Both! I was weaned on Star Trek, but let’s face it, we all want to be Luke Starkiller holding his famous Laser Sword. Android. I’m allergic to unicorn tears. What was your first IT job? I was at another IT training company as a trainer, and I was also supporting IT. Totally unofficial. I did all sorts of stuff, desktop admin, networking, server admin, and remote support. So, you started as a trainer. What topics have you taught? Did you know you wanted to be in IT? Or did you stumble into it? My plan was to be a high school science teacher. But when September rolled around and I still hadn’t landed a position (and I was too chicken to substitute teach), I decided to apply for a job advert that read “propellerheads wanted.” That seemed like me. What’s your training (teaching) philosophy? Learn from everything and everyone, simplify, and share with the same energy and enthusiasm that I felt when I first had that “aha!” moment understanding IP addresses. What do you think is more important for an IT career, certifications or degrees? Why? Certs! From a financial standpoint alone, I think that certification is the better payoff. In technology, degrees aren’t current for long. Certifications, on the other hand, naturally follow the path of the products they endorse. I’ve been training IT pros for 20 years. In that time, I’ve had the chance to watch literally hundreds of lives be changed. All because certifications helped them get into their first IT job. It was even better to see these people advance into better jobs because of their proven perseverance. Do you think IT pros should go deep or wide with their skill sets? What one piece of advice would you give a new IT pro on how to be successful? Be a people person and make friends. As an IT pro, you get the opportunity to touch the lives of everyone in the company, which gives you a unique ability to brighten or darken everyone’s day! Plus, you will find that engagement pays off in a lot of reciprocal trust and (occasionally) forgiveness. Right now, Microsoft MCSE, MCSA, MCDBA, and CCNA. I haven’t been focusing on certifications myself personally for several years now, but I’ll be adding to this list at CBT Nuggets. Finally, what are your hobbies? I like hiking and reading — fiction and non-fiction. I love watching my kids grow up. I also play guitar, ukulele, and banjo.